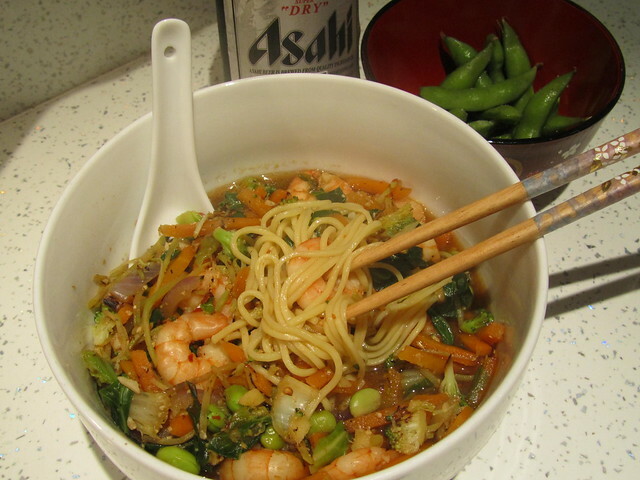 It’s getting colder now, so this month I decided to make a healthy, warming dish – Prawn Ramen (or エビラーメン / ebi ramen in Japanese). 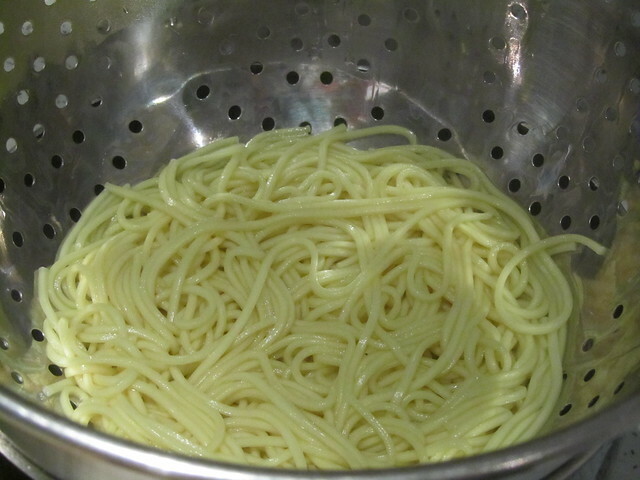 Ramen is originally a Chinese dish, but has been popular in Japan for so long now that it’s practically Japanese. When I was in Japan I often found myself frustrated because, as a pescetarian or vegetarian I couldn’t eat in ramen restaurants. You see, even if you order seafood ramen, there will almost always be pork in the broth (although staff in the restaurant may not think to mention this if you ask if there is any meat in the dish). 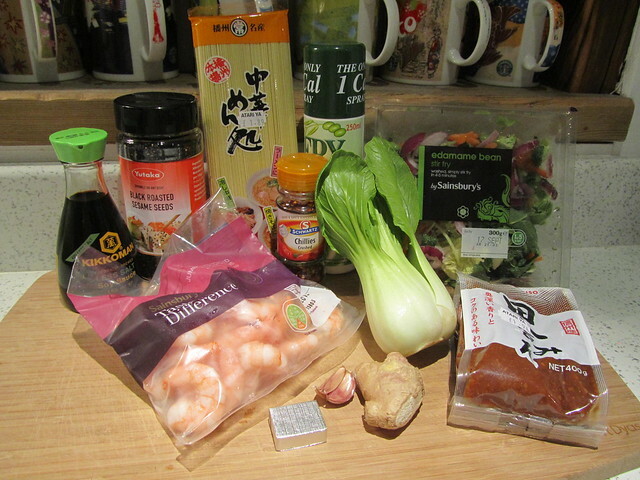 I’ve made my own ramen dishes a few times before, but this recipe is by far my favourite. It’s adapted from a recipe in the October edition of Slimming World magazine, so it should be quite healthy. If you’re familiar with the Slimming World diet, you might like to know that this recipe has less than two Syns per serving (on Extra Easy). 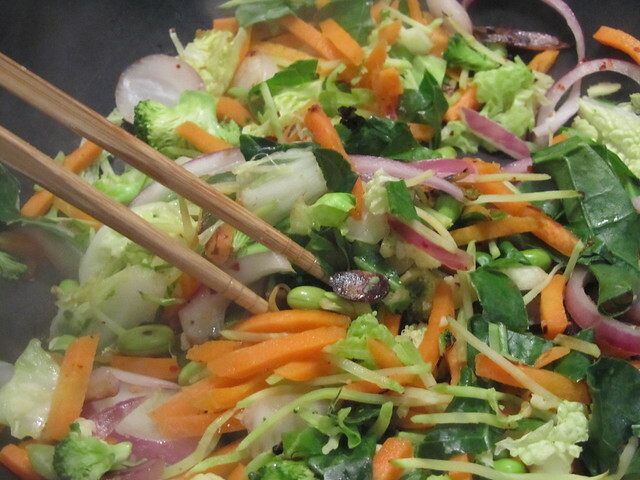 Spray a wok with Fry Light and place over a high heat. 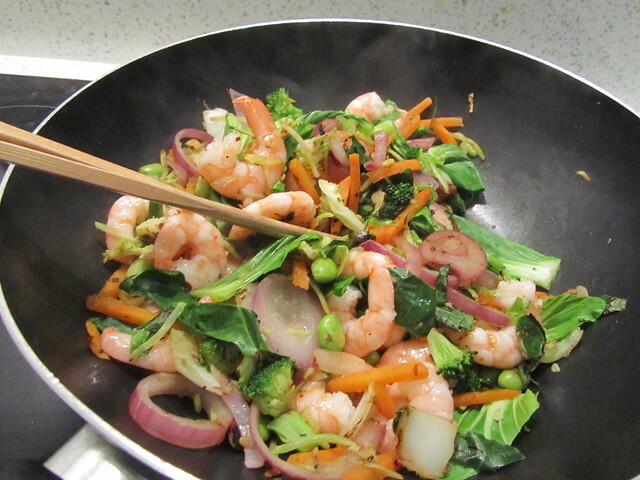 When hot, add the stir-fry vegetables, garlic, ginger and chillies, and stir-fry for 2 minutes. 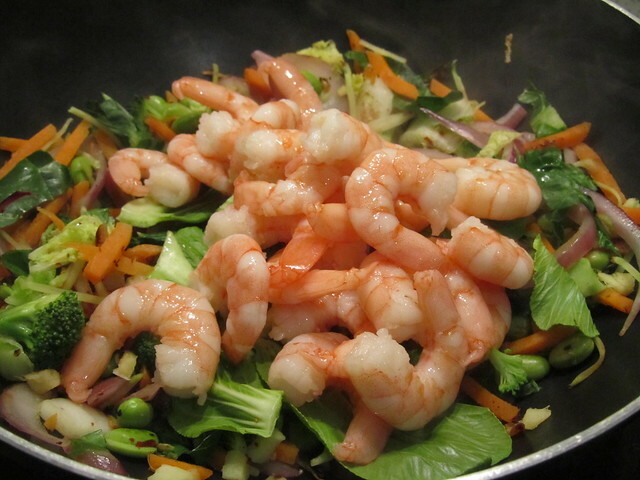 Add the pak choi and prawns. Stir-fry for a further 2 minutes. 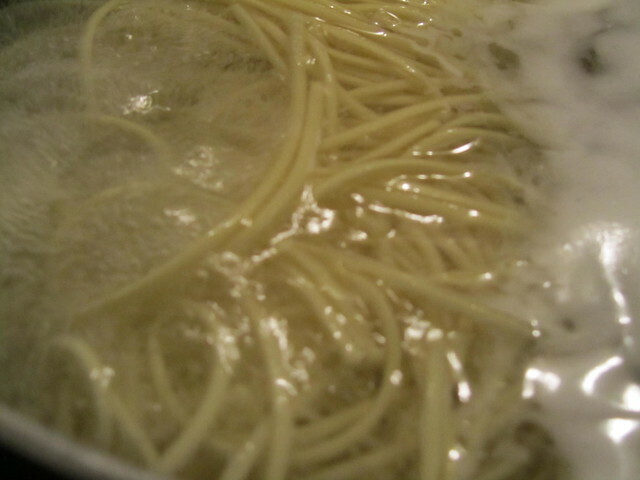 Add the stock, miso and soy sauce, and cook for 3-4 minutes. 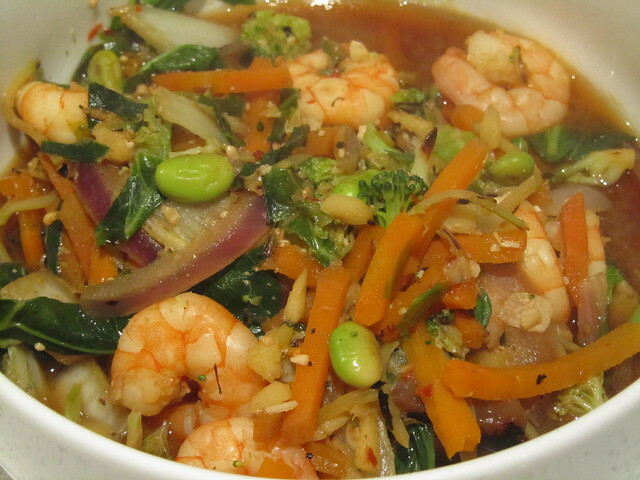 Divide the noodles between two bowls, then ladle over the prawns, veg and hot broth. Scatter over the sesame seeds and serve. Suggested side dishes: edamame and beer! And there you have it – a very quick, easy to make, delicious winter warmer. I had one portion for dinner and kept the other portion in the fridge for a couple of days to have later. 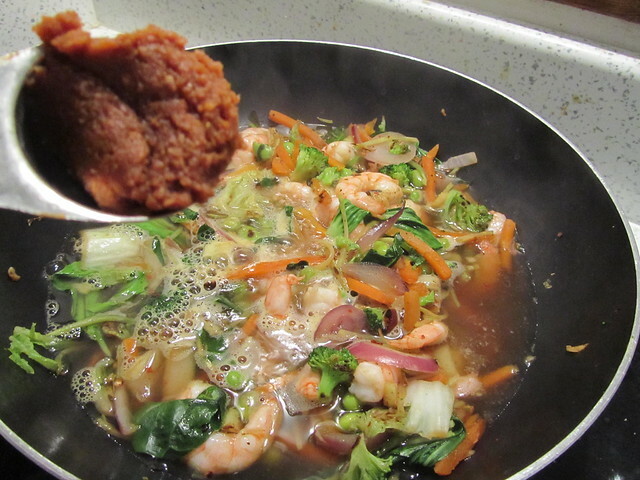 It tasted fine after reheating in the microwave, although the prawns became a little rubbery. I love the details on how the stirfry develops, but also noticed the asahi dry bottle in the background. Surely there must be more to Japanese beer and wine or is it just too hard to get in this country? Wow, I didn’t know that! Thanks! Wow this looks so delicious that my mouth is watering!